I don’t know about you, but I’m the kind of person who often craves a sweet bite at the end of a meal or later at night. I fully realize that this isn’t doing me any favors, and so I try pretty hard to prevent catastrophe by resisting from buying any snacks or junk food when I’m at the grocery store. Instead, I buy fruit and tell myself that when I’m craving sweets, I can just reach over and eat a pear or an orange. Right, but I must be delusional whenever I go grocery shopping, because whenever I happen to be actually craving dessert, I never ever feel like having fruit. Let’s not even get into how much of my well-intentioned fruit purchases go to waste. 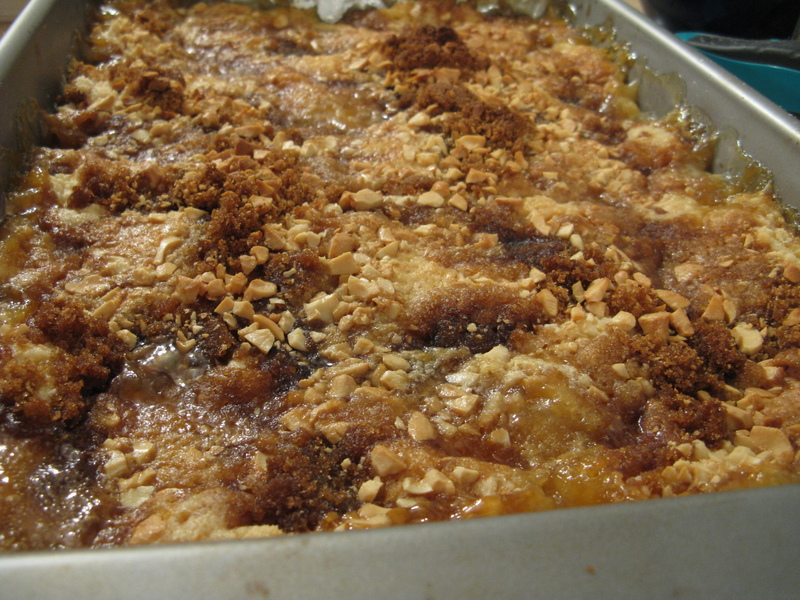 Anyway, I came across a post on Bakerella about peach dump cake (which she politely re-termed “peach crunch cake”), and the fact that it was so incredibly easy to make pretty much sold me on it. The one thing I value the most these days is time, and if I can crank out a dessert with minimal time and effort, then I am a happy camper. I can’t rave enough about how much of a no-brainer this cake is. 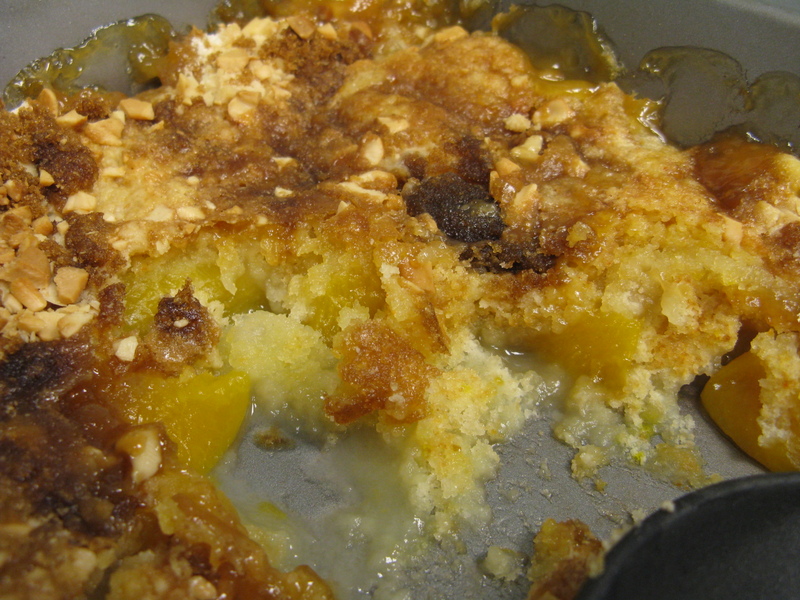 Though it’s definitely more like a peach cobbler/crisp than an actual “cake”. But I’m okay with that. All you need is canned peaches, boxed cake mix, butter, brown sugar, and optional nuts (I used cashews because that was all I had on hand, which came out quite nice). Seriously, that’s it. It’s called dump cake precisely because you practically just dump the ingredients in a baking pan, one after the other. Then bake and you’re done! And it was really delicious, especially warm right out of the oven. 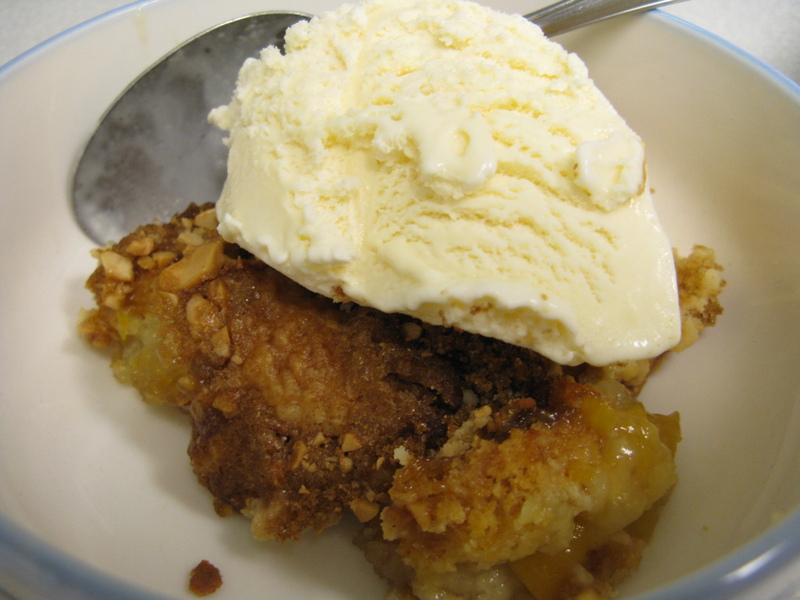 The only thing I didn’t like about the recipe was that it had too much sugar in it, so it was too sweet, especially when served with ice cream. I ended up eating it with some plain yogurt to help temper the sweetness, which worked out quite well. On the bright side, that meant that only a few bites of the dump cake was enough to satisfy my sweet tooth, and that actually was kind of nice for the purposes of getting that thrill of dessert without really indulging. In any case, I did reduce the amount of sugar in the recipe below. 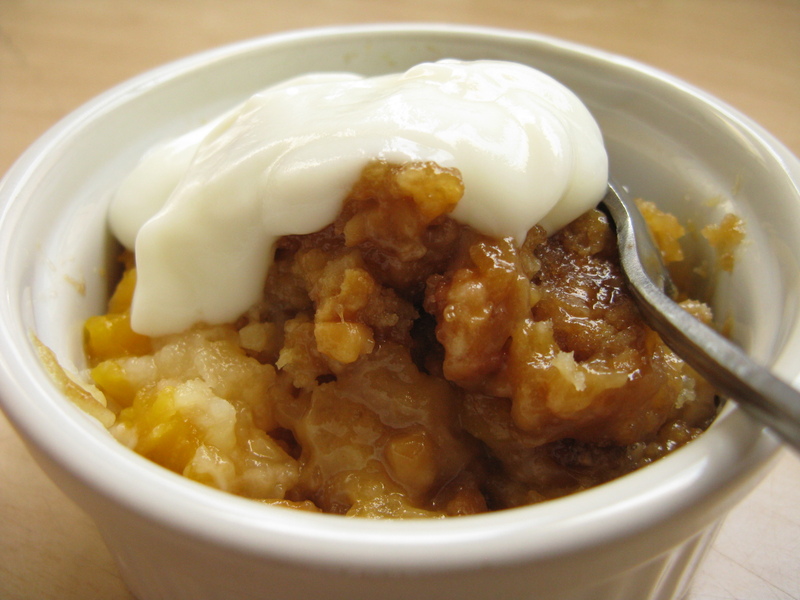 Dump cake is normally made with canned cherries and pineapple, but I liked the idea of canned peaches instead. You can substitute real fruit or other canned fruits of your choice (I imagine cocktail fruit would be great), and mix and match the cake mix as you please. I’ve heard that a black forest version of this cake using canned cherries and chocolate cake mix is delicious, mmm. Enjoy!! 1. Preheat oven to 350 degrees F. Pour canned peaches, along with syrup, into a 9×13″ baking pan, leaving out just 1/2 cup of the syrup. 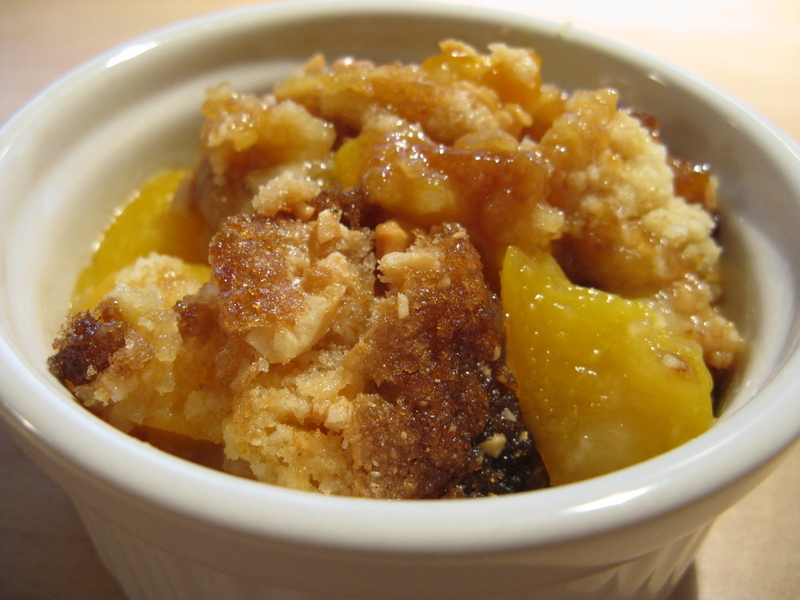 Gently cut up the peach slices into smaller chunks, and spread out evenly in pan. 2. 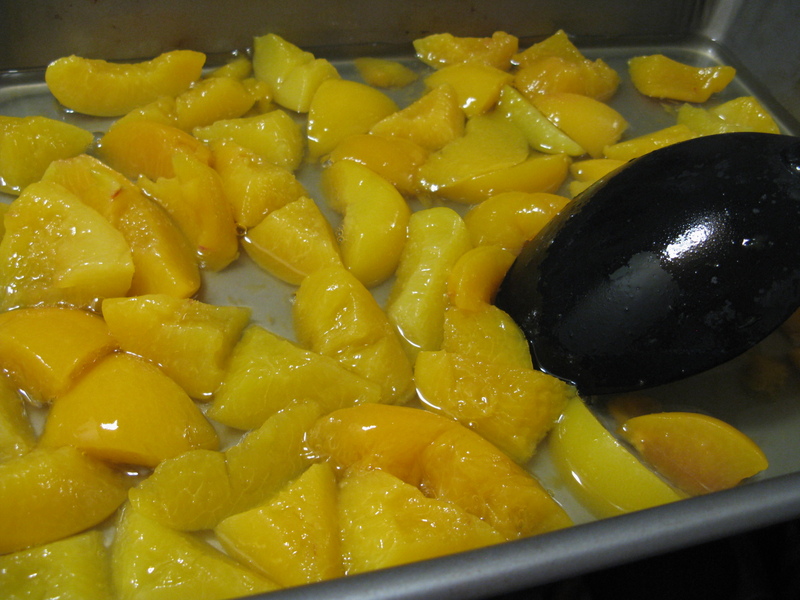 Spread the yellow cake mix over the top of the peaches, covering evenly. 3. 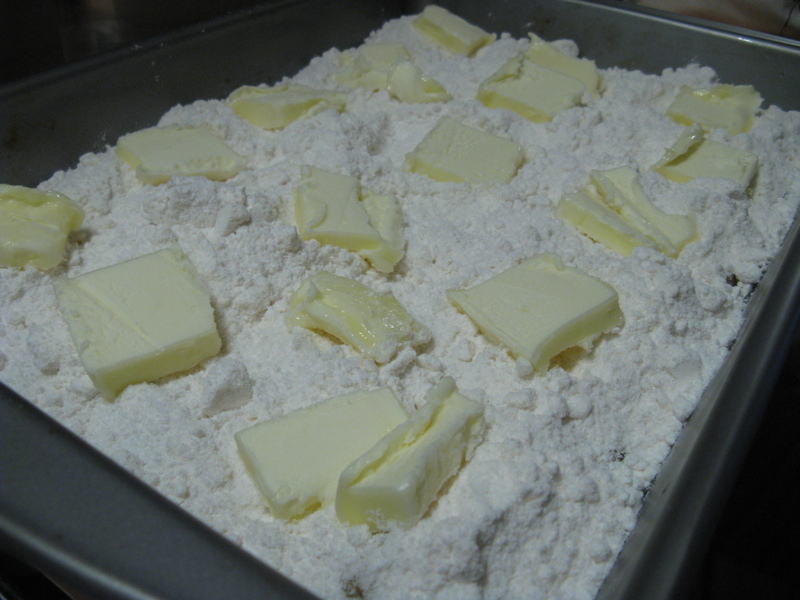 Cut up butter into 16 pieces and spread over the top of the cake mix. 4. 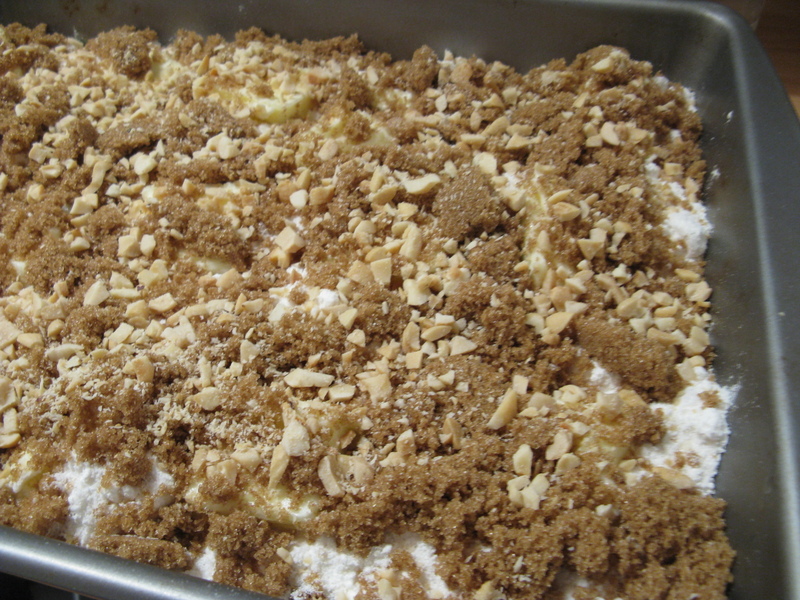 Sprinkle brown sugar and chopped nuts over the top of the cake mixture. That’s all there is to the prep work! 5. Bake for 40 minutes at 350 degrees F, and remove to cool slightly before serving. This entry was posted on Tuesday, May 4th, 2010 at 6:38 am	and posted in American, baking, desserts, fruit and nuts, recipes, Uncategorized. You can follow any responses to this entry through the RSS 2.0 feed. « Hidden surprise heart cake!